For a limited time, DeltaGIS Map Edition, will be offered for a special of only $418 for a limited time for this version! Click here to order now! 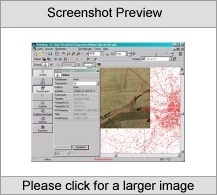 Graphical Field Management of GPS Measurements, Import of ESRI-Shape and GPS files, EU conform Field Protocol as PDF, True-of-scale Print in free selectable scale; All Fields in a single farmmap; Edits Fields, Individual coloring, Field splitting; Recognizes restricted areas; Calculation of Areas and Distances; Editoptions for Symbols (e.g. tress, stones), Text and freehand drawings Try the free trial version first, or click here for pricing/to purchase a full version! Order by phone, fax, cheque, money order, or order securely online!